Nearly 30 years after his death, Garry Winogrand is still generating controversy—this time because he had the poor taste to die with his work incomplete—with 6500 rolls of film either undeveloped or completely un-edited. The question seems to be, if Winogrand snapped the shutter, but never saw the image as a photograph, is it a “real” Winogrand? This seems like a strange question, really—and gets to the heart of what a photograph is—and what it means to create a work of art—both questions becoming more interesting as our viewing habits pass from paper to pixels. Some photographers work like some painters—taking control of the entire process from selecting the camera and film and paper, producing finished prints, and editing that work into finished book projects—Robert Adams and Lee Friedlander both work this way. But lots of artists work with others—in teams—Ansel Adams used assistants for most of his working life—as did Andy Warhol and nearly every painter since then. Winogrand began by doing his own printing, but really never had the patience for it—there are stories of people coming to visit his apartment to be confronted with endless stacks of unspotted prints—most of which seem to have ended up in the Winogrand archive at the Center for Creative Photography in Tuscon—and eventually ended up using the services of a very good printer who created many of the “finished” (signed by Gary Winogrand) images in circulation. I once read that Garry Wionogrand always developed his own film—I went to my book collection and found the reference—a 1981 interview with Barbaralee Diamonstein—now available on YouTube. Winogrand was living and working in LA in 1981 when the interview was done—one thing he mentions is that he’s working on photographing ‘the entertainment business’. Which is a useful piece of information—I purchased one Winogrand image about 5 or 6 years ago—bought it off of E-bay, where it was identified as being from his “Mothers and Daughters” series. The image is signed on the back by Garry Winogrand, but the signature is small and very careful—perhaps this was one of the many prints he signed en-mass shortly before he died. It does not look like the signature of a large living photographic lion. I have never heard of Winogrand’s “Mothers and Daughters” series other than the E-bay description for this item. The image may be from 1982—there is a designation “1982-157A” written in pencil on the back of the print—a date consistent with both the bottle of Perrier on the table, and the look and feel of the image. The sun is shining bright—almost straight down—looks like lunch time. There are three pairs of mothers and daughters in the picture, as well as a Ringo Starr look-alike, and Snoopy, dressed in tails at the nearest table (I bought this print because my son is fond of Snoopy). 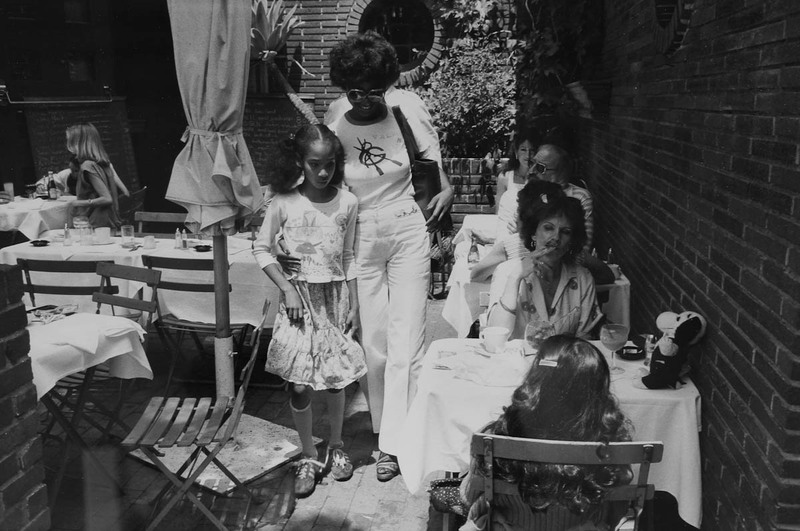 There seems to be a look being exchanged between two of the daughters—the central figure—a black girl of about 10—and a girl with luxurious curls in the foreground. While the central figure seems somewhat apprehensive, she is being guided by her mother, who is smiling and walking confidently towards the camera. I’ve never seen this photograph published anywhere—but it is definitely a Winogrand—and shows that, at least on some occasions, he could still find subjects worth photographing, and catch the picture at the perfect instant. The new Garry Winogrand exhibit at the San Francisco Museum of Modern Art and the accompanying hefty catalogue, is the next attempt to complete the task that Szarkowski described. What is surprising in the new volume is not only the attention paid to Winogrand’s late work, but the number of new images found from Winogrand’s early work, in the 1950s and early 1960s. Many of these images were marked on Winogrand’s contact sheets, but were presumably never printed (or acceptably printed) by him. There have been several strongly written complaints about the book design of the catalogue—especially about the layout of the images—but worth noting is that the book was designed by a committee of three—and the spreads contain two, three, or four images—including some verticals—so the book design had to accommodate a variety of layouts—not an easy problem to deal with—and not every spread looks perfect—but the book definitely captures the energy of Winogrand’s photographs. This is accentuated by placing the images as close together as possible—leading to a legitimate complaint that the book doesn’t lie flat (it does just fine if you are willing to break the binding) and some of the images suffer—but the images definitely converse with each other across the spread. And, as a whole, the pairing and sequencing of the images is a major part of the fun of the book. To die early and leave the editing to others is not without its risks, however. I once heard a group of photographers discussing Winogrand—“He’d run over his grandmother to get a picture” one of them said—and it wasn’t intended as a compliment. And the new volume contains a picture of somebody’s grandmother who apparently got run over—and the editors of this book have placed next to an image a group of well dressed men, some with faintly bemused smiles, but one laughing joyously, looking across the gutter at the poor woman. I can’t decide if this sequencing is a mistake, a very funny joke, or if some photographic scholar is going to rot in hell (filled with nothing but endless prints of “Moonrise over Hernadez, New Mexico for all eternity) for this pairing—but it certainly shows the power left to the editor if the artist dies and leaves someone else in charge. I watched the Garry Winogrand interview with Barbaralee Diamonstein earlier today—sat through to the bitter end, when it seemed the interviewer wanted Winogrand to make some profound pronouncement about his photographs and their meaning. Winogrand fails completely to do so—he looks away from the camera, distracted, and then mutters, “it’s about living life, that’s all”. Which, perhaps, bookends his 1964 Guggenheim application “we have not loved life” quote. One can accuse Winogrand of running over his grandmother to get a picture, or of not getting his work done—but one cannot accuse Winogrand of not loving life. His photographs remain powerful because he, with his camera, collected slices of life. Who can blame him for being like a butterfly collector who would rather chase live butterflies in the field than endlessly rearrange those already on pins in the case? In the end, he left us more than he knew—pictures he himself never had the time or inclination to finish. But he did his work—he had his camera, he got the shot, he took the film home, and kept in a safe place. But back to the question posed at the beginning of this post—When is a photograph finished? The best answer I know is one given by John Gossage in the introduction to “Snake Eyes”—“The viewer completes the work of art”. Which I think is to say, Winogrand left us with many photographs, only some of which saw completion in his lifetime. The fact that he did not have the time or energy or inclination to develop his film or edit his contact sheets does not matter—he saw faster and better than anyone else, and got what he saw on film—the rest can be done by others. A photograph is finished only when people stop looking at it. Until then, it still has life. And Winogrand’s photographs, individually and collectively, are full of life.